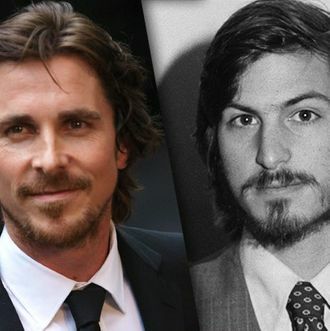 Christian Bale will no longer “crush it” in the role of Steve Jobs: Two weeks after he was announced in the role, The Hollywood Reporter notes that Bale has dropped out of Danny Boyle’s Jobs during pre-production. It’s the latest turmoil for a project that has been abandoned by both David Fincher and Leonardo DiCaprio in the past year, and what Bale’s departure means for Seth Rogen’s job (playing Steve Wozniak), hope (for an Oscar), and cash remains unclear. Fortunately, Aaron Sorkin’s still onboard as the writer, which means the speechifying will remain.